The Boilermaker traditionally is a shot of whiskey, tequila or vodka and a glass of beer. There are many ways to drink the boilermaker. Drinking the shot of liquor and chased by the beer. Pouring the liquor into the glass or the Depth Charge, dropping the shot into the glass of beer causing the carbonation to fizz at a quick rate forcing a quick consumption. Normally I would associate this type of drinking behavior to the college kid or serious bar fly. 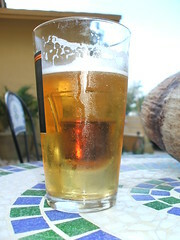 However, a shot of amaretto gently dropped into a nice quality beer makes for a fine afternoon drink. The 'college' version of this is called a Flaming Dr. Pepper in which the young drunk tops his beer with 151 proof rum and lights it with his trusty zippo. So, give it try and enjoy.